In 2 hours this morning, over 100 “kids” of all ages to built their own ASTEROIDS game from Scratch. 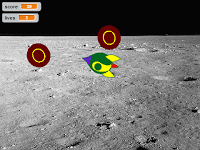 And by Scratch I mean from a blank slate in MIT’s web based Scratch IDE. The challenge in teaching kids to program is keeping it fun. A 10 minute lesson on variables is not nearly as engaging as a 10 minute programming session trying to figure out how to keep track of how many asteroids your spaceship has destroyed. 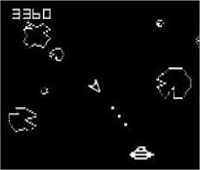 When I asked the roomful of eager young students if they had ever played ASTEROIDS not a single one under the age of 30 raised their hand. So we started with a demo of the game and talked about the different pieces we would need to build to make the game. I didn’t use the word “requirements” or “stories” (for the Agile folks). But the students knew that there was a logical place to start – the Spaceship. So we built a spaceship. We proceeded to ask about what spaceship should do – and of course things like “fly”, “turn” and “shoot” came up. So we made it do all those things. Of course you need something to shoot. So we made asteroids. And “Catsteroids” and “duckstroids”, whatever they wanted. But they all had to blow up. Which meant we had to keep track of how many we had blown up. Then the spaceship had to blowup if it got hit. That was pretty much what we did in 2 hours – here is a link to the projects that the kids created – I was impressed by the creativity! If you want to see how they did what they did, click the “see inside” button on any project.